It was a miraculous escape for the woman, who appeared to jump off a moving train in order to retrieve her bag. It had fallen onto the platform as she was boarding the Panvel-bound train at Mumbai's Kurla Railway Station. 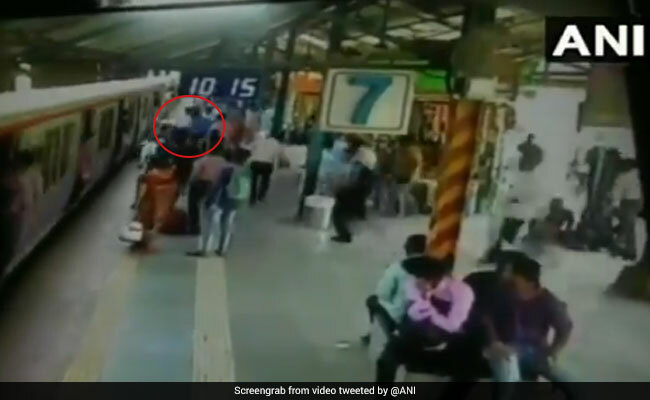 It was an incredibly close call for a woman in Mumbai who fell and nearly slipped under a moving train while trying to pick up her bag, which had fallen onto the platform. A number of commuters and Railway Protection Force (RPF) personnel immediately rushed to help her up and saved her from potentially being run over by the train. The woman was trying to board a Panvel-bound train from Mumbai's Kurla Railway Station on Monday when the incident occurred. According to The Times of India, her bag fell onto the platform as she was trying to board the train. To retrieve her bag, the woman jumped off the train, which was already in motion. That's when she lost her balance and nearly slipped through the gap between the train and the platform. But fortunately, passengers waiting on the platform and RPF personnel saved her, preventing a tragedy. News agency ANI tweeted surveillance footage of the incident. In February, a woman nearly slipped into the gap between the bogie and platform as she tried to board what appeared to be an inter-city train at Mumbai's Central Railway Station. Acting quickly, RPF personnel saved her from slipping under the moving train. A CCTV camera showed the uniformed personnel pulling her to safety in the nick of time.